창덕궁 회화나무는 창덕궁 돈화문을 들어서자마자 관람로 양 옆에 나란히 자라고 있는 회화나무 8그루로 나무높이는 15.0~16.0m, 가슴높이 줄기직경은 90~178㎝에 이르는 노거수이다. 회화나무는 궁궐 입구에 특별한 사유를 가지고 심어 가꾸어 왔는데, 창덕궁 돈화문 주변은 궁궐의 삼조(三朝) 중 조정의 관료들이 집무하는 관청이 배치되는 외조(外朝)의 공간에 해당되는 곳으로 궁궐 입구 주변에는 예로부터 중국 궁궐 건축의 기준이 되는 「주례(周禮)」에 따라 회화나무를 심었다. 창덕궁 회화나무는 위와 같은 사유로 궁궐 앞에 심겨진 회화나무 중 남겨진 것으로 추정하며, 1820년대 중반에 제작된 「동궐도(東闕圖)」에도 노거수로 그려져 있는 것으로 보아 수령은 300~400여년으로 추정된다. 또한 이들 회화나무 8그루는 조선시대 궁궐의 배식 기준과 의미를 살펴볼 수 있는 중요한 노거수로 판단된다. 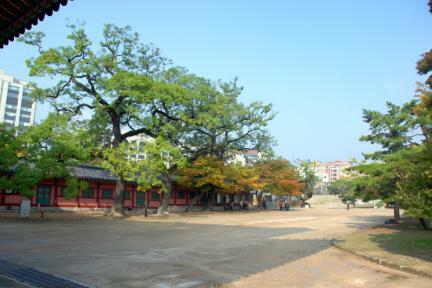 The Forest of Pagoda Trees at Changdeokgung Palace is located to the left and right of the path that begins right inside the front gate, Donhwamun Gate. There are eight of these old trees, each standing 15-16m high with breast-high circumference of 90-178cm. The pagoda trees were planted at the entrance of the palace for a particular reason. 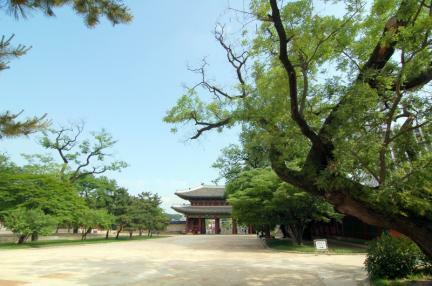 This area is equivalent to the outer courtyard, the first of the three main courtyards, where the king and his cabinet administered state affairs. 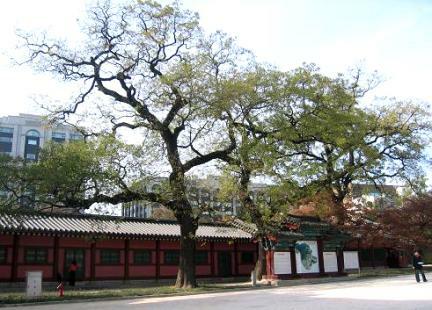 The pagoda trees are presumed to have been planted at the entrance as prescribed in the Chinese classic Zhouli (Rites of Zhou), on which ancient palace architecture is based. According to Zhouli, the outer courtyard is where the king met with his three high ministers, high officials, and members of the aristocracy. 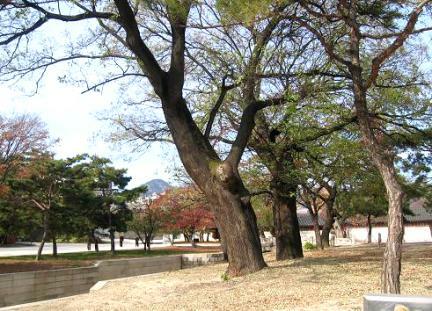 The pagoda trees were planted as place markers for the three high ministers and were accordingly a symbol of their rank. 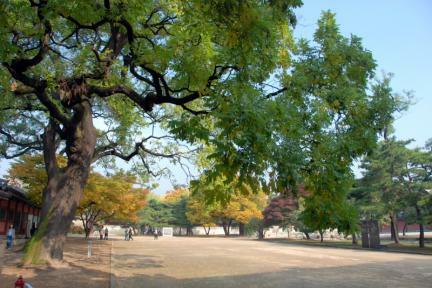 The pagoda trees at Changdeokgung Palace are probably those that remain among the pagoda trees planted at the front of the palace for the aforesaid reason. 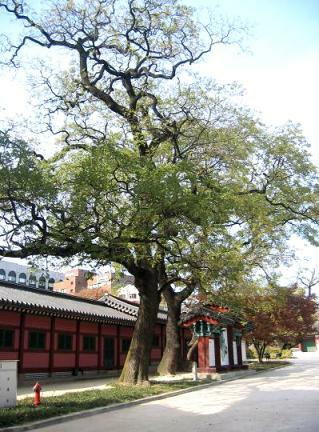 As there are old trees indicated in Donggwoldo (album of paintings of Changdeokgung and Changyeonggung palaces) produced in the 1820s, the trees are about 300-400 years old. These eight pagoda trees are very important since they give insight to the standards by which trees were planted around the palace.